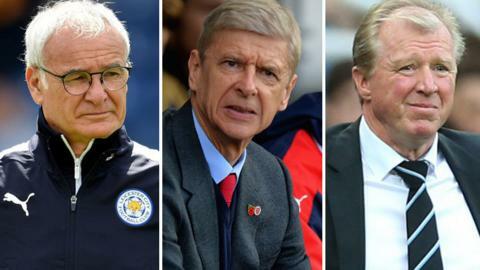 Will Leicester manager Claudio Ranieri (left), Arsenal boss Arsene Wenger (centre) and Newcastle manager Steve McClaren be making many signings in the January transfer window? "We're desperate for a clinical goalscorer. And we need more pace on the right wing. Oh, and a commanding centre-half wouldn't go amiss." Whether their team is fighting for the Premier League title, battling relegation or aiming for a late surge towards European qualification, most supporters would like to see their chairman splash the cash when the winter transfer window opens on 2 January. English top-flight clubs have collectively spent £130m in each of the past two January transfer windows - will they match that figure next month? Our Match of the Day pundits - Alan Shearer, Mark Lawrenson and Chris Sutton - discuss where each of the 20 Premier League clubs need to strengthen before the 1 February deadline. And they are helped by SAM the Super-Computer - a sports analytics machine built at the University of Salford - which uses player information to predict the outcome of a match. By replacing a player on a team with an alternative, SAM can predict the result of a match as if the incoming man actually played - and is therefore able to tell us how teams will benefit (or not) from any possible business. Stat attack: Arsenal have conceded five fewer goals at this point in the season than they had in 2014-15. Former Newcastle and England striker Alan Shearer: "Arsenal are in a strong position in the Premier League and also through to the last 16 of the Champions League again. But they always seem to get injuries - already this season is no exception - so they need to strengthen their squad for the second half of the season. "Another centre-forward, a defensive midfielder and a centre-half should all be on Arsene Wenger's list but the difficult thing for Wenger is to find a way of doing that in the middle of the season to improve his team." Stat attack: Villa are the joint lowest scorers in the Premier League this season, having scored just 15 goals in their 19 matches. Their shot conversion rate of 9.8% is also the lowest in the top-flight. Former Liverpool and Republic of Ireland defender Mark Lawrenson: "I don't see any goals in this Villa team. Where are they going to come from? If Villa do make any signings in January, I would suggest they are with one eye on the Championship as well." Shearer: "Remi Garde wants to bring in some experience in January, and clearly he will be trying to sign better players too. But his problem, if Villa are still so far adrift, will be who can he get? "For starters, I can't imagine many players wanting to go there with relegation looking almost certain. He also needs to consider whether to buy players for the present situation or look ahead and buy players for the Championship to try to get Villa up next season. That is not a nice situation to be in, but it looks like it will be the case." Stat attack: Bournemouth have faced the fourth highest number of shots after 19 matches, their goal being peppered with 203 efforts. That contributes to the fact they have conceded the joint-second highest number of goals, leaking 34 times so far. "There is nothing much wrong with this Bournemouth side. They are not outstanding defensively, but they can be good enough, they create lots of chances and getting someone to make the most of those could be key. "They probably have QPR striker Charlie Austin's number on speed-dial. "However, it may be difficult to attract players who might be wondering what will happen to their contract if Bournemouth head straight back down." SAM: "Striker Joshua King and Glenn Murray are doing a good job in Callum Wilson's absence. A fit Wilson would give Bournemouth very little between now and the end of the season". Stat attack: Chelsea are 26 points worse off than they were at the start of last January's transfer window. The Blues have won nine fewer matches, lost eight more, scored 18 fewer goals, and conceded 15 more. Former Chelsea, Norwich and England striker Chris Sutton: "They might try and freshen things up but I suspect they will wait until the end of the season. I don't think there is any point in panic buying. "I think owner Roman Abramovich will wait and see whether the players react to the change of manager and if Guus Hiddink can get more out of the same group of players that won the Premier League last season. "Chelsea have been linked to various strikers but I'm not sure they will sign one. If anyone is under threat by potential January signings then maybe it would be Cesc Fabregas. I don't think he has the same impact anymore and his legs are on the wane." SAM: "If Chelsea were to finally get their man and sign defender John Stones from Everton, SAM does not expect an increase in their expected points tally this season. Of course, the impact in future years may make the signing worthwhile - John Terry cannot go on forever!" Stat attack: Palace are the seventh highest scorers in the Premier League this season with 23 goals in 19 matches, only behind Leicester, Manchester City, Everton, Arsenal, Tottenham and West Ham. However, they are only 14th in the 'shot conversion' rankings with 12.57%. Sutton: "Would someone like Charlie Austin, who is reported to have turned Palace down in the summer, offer them more cutting edge? Possibly in terms of goalscoring. But I think, in terms of his all-round game, Connor Wickham has offered plenty this season. "Wickham hasn't scored many goals yet but I've been really impressed with his hold-up play and bringing others into play with Palace set up to counter attack. He looks a handful and I think we will see him get better. "Palace will find it difficult to attract top players and spend top money - I think they have to be satisfied. I think it is more about keeping the likes of Yannick Bolasie, who surely must be attracting the 'big guns'." Stat attack: Roberto Martinez's side have conceded 28 goals in their 19 Premier League matches this season, meaning only teams in the bottom seven have conceded more. The Toffees, who are 11th, have also dropped nine points from winning positions. Sutton: "I don't necessarily think it is a case of needing new personnel - it's just the way they play. They are expansive, bomb the full-backs forward, it leaves holes at the back and they are caught out because of their style of play. Phil Jagielka is coming back from injury - but it would be the same with him playing." SAM: "Considering how Everton would fare if they were to sell 15-goal striker Romelu Lukaku is an interesting one. It appears that Everton will lose very little - they have cover for him. Between Kevin Mirallas, Arouna Kone and a few others, they have enough firepower to continue as they are. The expected change in points is a 1.73 decrease between now and the end of the season." Stat attack: Leicester are the joint top-scorers in the Premier League with 37 goals in their 19 matches - Jamie Vardy (15) and Riyad Mahrez (13) contributing 77% of them. The Foxes had scored in every top-flight match up to 26 December, but have now recorded two successive blanks. Shearer: "Should Manchester United try for Jamie Vardy? I think Leicester will have a decision to make because I think clubs will be in for Vardy. Whether United are one is a different matter." Lawrenson: "I think the only way that Leicester would sell Vardy or Mahrez would be for mad money. If either of them asked for a new contract at the start of January, you would give them one, wouldn't you? They are doing so fantastically well. I very much doubt either will be sold with Leicester doing so well and the possibility of Champions League for next season. "As for Leicester, they have money to spend but they do not need to go crazy in January, just look to flesh their squad out a bit and increase competition for places in certain areas. Everything is working well for them at the moment so why not get some cover for when it isn't. They are in a position of strength so why not make themselves stronger." SAM: "Replacing Vardy with Andrej Kramaric, who was a £9m signing last January but has struggled to make an impression, causes an expected loss of 9.6 points between now and the end of the season. A massive impact." Stat attack: Liverpool have attempted 301 shots in their 19 matches, only three teams - Manchester City, Arsenal and Tottenham - have had more. But the Reds have the third lowest shot-to goals ratio. Their tally of 10.94% is only superior to Swansea (10%) and Aston Villa (9.8%). Lawro: "I am not expecting Jurgen Klopp to do anything major in January. I don't think he is actively looking for new signings as yet, I think he is more intent in giving everybody a go and seeing what he has got in his squad." SAM: "If Daniel Sturridge was fit, Liverpool would gain less than one point. According to SAM, the players they have in their squad should be covering for him. Between Christian Benteke, Roberto Firmino and Philippe Coutinho, they should be scoring the goals he would be expected to score." Stat attack: Manchester City are the joint top-scorers in the Premier League with 37 goals in their 19 matches. Perhaps unsurprising as the Blues have attempted 331 shots - more than any other team and 34 more than nearest rivals Arsenal. Lawro: "I don't think that Manchester City need anything to be honest - apart from injured skipper Vincent Kompany back. "They just need him fit. After spending £64m on Eliaquim Mangala and Nicolas Otamendi since the last start of last season, I don't think you go out and buy another defender. It is clear that Kompany plus one is their best centre-back combination. It is so frustrating for him and the club, you wonder if there is an inherent weakness. "Star striker Sergio Aguero has also suffered from a string of injuries and Wilfried Bony has not been convincing in his absence. But the question is who are you going to get who is going to be good enough to play for Manchester City? You are looking at Champions League quality players and none of those are going to be available halfway through a campaign." SAM: "The player that SAM has identified that City are most in need of is a defensive central midfielder. Signing Paul Pogba will get City an extra 4.3 points. But a very interesting observation is that the top Premier League teams gain little from new players arriving in January - typically an increase of less than one league point. Manchester City basically only significantly improve if they sign Lionel Messi or Cristiano Ronaldo...and that is highly unlikely to happen." Stat attack: The Red Devils have the eighth highest shots-to-goal ratio (14.97) in the Premier League this season. And they are shot-shy. Louis van Gaal's side have only 212 shots, with only Stoke, Aston Villa, Sunderland, Newcastle and West Brom attempting fewer. Shearer: "United definitely need a striker, there is no doubt about that, but they are going to have the same problem as all the top clubs because the quality player they want is probably not going to be available." Lawro: "Can United solve any of their problems in January? It depends who they can get. A new number nine might help but they need to inject some pace into their team and, more importantly, start to play with the handbrake off a bit. "They are good enough defensively to cope with most sides but from midfield going forward it is just so pedestrian. That is a problem. I was reading that they were trying to get Arjen Robben from Bayern Munich and I know he knows Louis van Gaal but would Robben want to come and play in this United team, and would he make that much of a difference? I'm not sure, not with the way they are playing. "It is a change of style they need as much as personnel." Stat attack: No Premier League side has attempted fewer shots on goal than Newcastle this season. The Magpies have mustered just 171 attempts in their 19 matches - an average of nine per match. Shearer: "I said a few weeks ago that Newcastle need a new centre-back and a centre-forward at the very least, and that still stands without a doubt." Lawrenson: "Newcastle's results might have improved in the run-up to Christmas but they still need to strengthen because don't forget this was a team that was in crisis not so long ago. They do need to strengthen and it will be interesting how they do it, and whether this time Steve McClaren is allowed to bring experience in rather than some players he can train up and make better." SAM: "Signing attacking midfielder Henri Saivet from Bordeaux - a player they have been linked to - would give Newcastle United a big improvement of 4.6 points." Stat attack: Norwich kept only their second clean sheet of the season when they won 2-0 against Aston Villa on 28 December. That's the joint lowest amount - alongside Villa. Lawrenson: "Goalscoring has been a big problem for Norwich this season and obviously that is the area they will be looking at in January. They are going to have to go and find a striker. I like Cameron Jerome's work-rate but he doesn't always find the finish like he did against Manchester United at Old Trafford earlier in December." Sutton: "The goalkeeping situation has been interesting with the experienced John Ruddy being dropped and Declan Rudd taking his place. There was a thought that the goalkeepers might be an area where Norwich would aim to strengthen. But I don't think they do - I've been impressed with Rudd. His confidence is high and they will give him a go. If they turned round and brought another keeper in now - what message would that send to him?" SAM: "Signing Marseille goalkeeper Steve Mandanda would increase Norwich's expected points tally by 1.7 between now and the end of the season - that could be valuable if they are in a relegation battle." Stat attack: Only four Premier League teams have attempted more shots than the Saints' 280 efforts across 19 matches this season. However, Ronald Koeman's side only have a shots-goals conversion rate of 11.82 - the fourth lowest in the division. Sutton: "Southampton have been a selling club in recent seasons, so I think it is more about hanging on to the likes of Sadio Mane and Victor Wanyama for them in January. They are going through a blip at the moment but there has to be that realism of 'who they are going to get that's better?' With all due respect to Southampton they're not going to get a tried and tested striker." Stat attack: Stoke have faced 289 shots so far this season - the fifth highest total in the Premier League. And 94 of those have been on target - the fourth highest total. But the Potters have only conceded 19 goals, which is the fifth lowest number. At the other end of the pitch, they have the worst shooting accuracy in the top-flight, hitting the target with just 39.51% of their 207 shots. Lawro: "They have plenty of quality and creativity at the top end of the pitch but goals are still a problem for Stoke. Marko Arnautovic is one of those players who is brilliant one week but will drive you mad the next three, so I would still say they need a striker. It is a big if, but if they can get a real quality striker I look at Stoke and think they could really push on. At the moment they are already a top-half team." SAM: "England goalkeeper Jack Butland has caught the eye for Stoke with a string of brilliant performances. How many points would lose without him if he left in January? Hardly any. Veteran keeper Shay Given coming in gives an expected loss of just 1.1 points." Stat: Sunderland currently have the worst defence in the Premier League, conceding 38 goals in their 19 matches. Not surprising seeing as they have allowed the opposition to rack up 121 shots on target - more than any other team. Lawro: Sam Allardyce has had a chance to look at his squad now and assess what he needs. I think he will try to bring in as many players as he possibly can, because there is lots of upgrading needed in all areas of his team. "His defence is probably the priority, though. That is the least Sam-like part of the Sunderland side at the moment because they are leaking soft goals. "They need a domineering central defender as a starting position to build a team around that. Wes Brown and John O'Shea might have been that player in the past, but neither are now." Stat attack: Swansea are the second lowest scorers in the Premier League, but have tidied up defensively in recent weeks - keeping three straight clean sheets. Sutton: "They have got problems because, unless things change soon, they don't look any nearer to appointing a new manager. It's surprises me that a new manager wasn't ready in place. Linked with Chelsea forward Loic Remy, would he improve them? A fit, confident Loic Remy would - they need goals. "What about Charlie Austin? With his goals record, we might see someone like Swansea gamble on him. "But first and foremost Swansea need to appoint a manager - it is only fair to have a new manager in place with the players which he wants." Stat attack: Tottenham boast the most accurate attack in the Premier League this season, having hit the target with 58.37% of their attempts. Star striker Harry Kane has scored 30.3% of their 33 top-flight goals. And they have the meanest defence - conceding just 15 times. Lawrenson: "Spurs need to buy some cover for Harry Kane. Any loss of form or injury for him would hit them very hard because they are nowhere near the same team without him. SAM "Losing Harry Kane, and not replacing with a player of similar quality would produce a massive effect on the expected points tally for Tottenham - a drop of around 12 points. This is the biggest impact any one player has had on a team." Stat: Nigeria striker Odion Ighalo has contributed 58% of Watford's Premier League goals this season, scoring 14 of their 24 strikes. Six of the other 10 have been scored by his forward partner Troy Deeney. Lawro: "Watford brought in a lot of players at the start of the season following promotion and, perhaps because of all those arrivals, manager Quique Flores has worked hard to find his best XI and kept faith in them to find their way. "He will be looking for strength in depth and perhaps might be interested in one or two players who can play a number of positions and so flesh the squad out that way with many different options. David Moyes used to be great at that when he was at Everton." SAM: "Surprisingly, it appears that Watford could cope if they were to sell Ighalo. They have loads of strikers with high potential, so that they might not miss him at all if they were to sell. Victor Ibarbo or Obbi Oulare could step in for example. "As such, SAM estimates a loss of less than one league point if they were to be without Ighalo for the rest of the season." Stat attack: West Brom have netted just 18 goals in their 19 matches so far, making them the third lowest scorers in the Premier League. That's largely because they haven't managed many shots. Their tally of 117 total shots is the second lowest in the top-flight. Lawro: "Saido Berahino and West Brom seems to be over as a relationship - Tony Pulis said everything by saying nothing the other day about the player and the England Under-21 international seems to have made up his mind to go. "If Pulis gets £20m for him that will be an absolute bonus for him - he won't move until that deal and the funds are secure. He likes to add at every opportunity because it increasing the intensity of competition around the squad. "Perhaps they will looks for an attacking midfield player - perhaps Spurs out-of-favour winger Andros Townsend - who can play left or right is a possibility." Stat attack: West Ham have scored six goals in their last nine Premier League games. They scored 20 goals in their first nine Premier League games of the season. Lawro: "Unless someone goes out on big wages then West Ham have said they will not be bringing players in. Although they should be boosted by the return of the likes of Dimitri Payet, Victor Moses and Diafra Sakho in the not-to-distant future. "This transfer window is generally for the bottom eight - anyone who fears they could sink into the abyss with a bad run and miss out on the television money for next season. "QPR striker Charlie Austin will be one they are all asking about. He's a proven Premier League goalscorer with only six months left on his contract." SAM is the Sports Analytics Machine built by Professor Ian McHale and Tarak Kharrat from the Centre for Sports Business at the University of Salford.